Well,….Barb left me. Gone, just a cloud of dust down the gravel road.... Most of you are thinking; “It’s about time!”. It’s not like she has not done it before, but this time she took the truck, the rig and Daisy. She just left me with the Jeep, a pile of clothes and hopefully enough food to get me through a few weeks. She is on her very first solo trip to Rapid City where she is going to meet up with our daughter Jessica and two of our grandkids Dylan and Kendall. Jessica is flying into Rapid City then the four of them are going to spend a week in the Black Hills and traveling back to Salt Lake where I will HOPEFULLY meet up with her in a few weeks. I have heard from her a few times, it sounds like they are having fun and she has gotten good at setting up the rig all by herself. I told her to take lots of pictures so she can blog about her adventure. Meanwhile back at the ranch…… I have moved into a 5th wheel they have in their shed. By shed I mean airplane hangar, this thing is huge! You could probably fit a dozen of our rigs in here and both end walls lift up just like airplane hangars. There are dozens of things to do around here at a given time. I have a lot of respect for these guys and what they do day in and day out, literally working from sunrise to sunset no days off. You can tell they have passion and love this lifestyle. I have been helping where I can. The other day we had 60+mph winds that knocked a bunch of trees into their fields so I spent a day on the tractor pushing them back into the woods. On another day, I had a “harrowing” experience. Harrowing is a method of tilling up a harvested field. In this case I was harrowing and dumping flax stubble. When the flax is harvested, the combine separates the seed from the rest of the plant (stubble) and drops it back on the ground. Flax stubble is not used for anything else so once it is raked into rows it is burned so the field is ready for the next planting in the spring. The harrow itself is 70’ wide and one thing I learned pretty quickly is that you have to watch the outside tires when you are turning corners. Many of the fields are bordered with trees and Bob’s parting words after he showed me what to do were; “Don’t hit a tree”…….Well you can probably guess what happened. About half way through my 3rd field, I was turning around….. I thought I had enough room, really I did….next thing I knew the outside wheel was sideways instead of facing forward! If you happened to hear a lot of screaming swear words in the wind last week, well that was me. I did not take any pictures as at the time it was not funny but after a few hours we had removed the wheel, welded the mount back to the harrow and I was back in business. Both Bob and Chris said that #hit happens and not to sweat it…..ya right. We proved that analogy true again a few days later when we burned the stubble rows. We picked a nice quite day with no wind and everything was going great. There were about 24 rows approximately 1/4 mile each, we would light the rows in several places and they burned hot for 15-20 minutes then they settled down and you just had to watch the edges and put anything out that crept near the ditches or swamps. 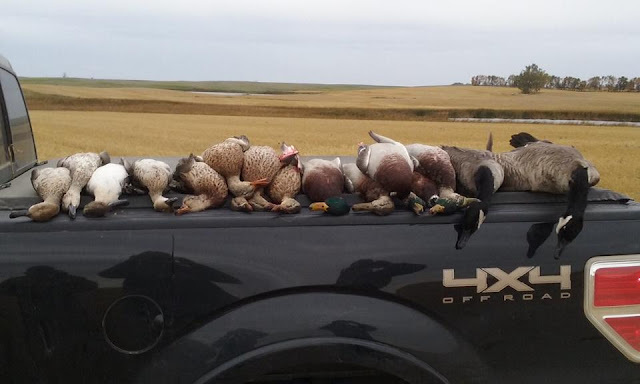 We had one area spread and was heading towards a ditch which took about 20 minutes to control when we were done with that we saw another area on the other end of the field had made its way into a cattail swamp. We rushed over there with the water truck but quickly ran out of water and the swamp was still a blazing! Luckily one side of the fire was heading to an area with water so we concentrated on the other end so it would not spread the other way. After about 45 minutes we had it under control but were covered with soot. No pictures of the actual fire as we were a little busy. I continue to be amazed by what shows up on the trail cameras that we put out. In addition to deer, we have gotten pictures of coyote, fox, skunks, raccoons, pheasants but by far the most unusual thing we have gotten on camera so far…..a moose! I find it bizarre that this historically woodland creature is wandering the flat farm country of north central North Dakota but they often see moose in the area. Life without Barb has been pretty lonely. There is no TV in the trailer so I have been reading a lot. A good friend of mine gave me a series of books by William Kent Krueger. He writes predominantly about crime mystery based in northern Minnesota and is very good. The problem is I only grabbed 4 books thinking I would read one a week but I am burning through one every other day. I did notice a 2016 Legacy Seed guide in the office, I might read that next! With luck Barb will still be in Salt Lake when I get there. But if you happen to see a white GMC pulling a Cardinal 5th wheel with a beautiful woman driving and a funny looking puggle next to her anywhere south of Salt Lake please shoot me an email…..she is probably trying to ditch me! We arrived at the Finken/Sobieck farm on September 30th anxious to catch up with old friends and hit the fields for some waterfowl hunting and field work. Bob and Deanna Finken and Chris and Holly Sobieck own and operate 4,000+ acres outside of Douglas North Dakota. We have known Chris since he was born some 28 years ago and met Bob and Deanna when he married Holly a few years ago. It has been a full year since we have seen them and time to catch up. See our rig way in the back along the grain bins? We love visiting them this time of year and there is no shortage of waterfowl or work and we got plenty of both! We duck hunted the first 4 days with Chris’ brother-in-lay Dylan, his dad Bob and his good friend Brian. We ended up getting quite a variety of ducks; mallards, widgeon, pintail, teal, red heads, scaup, and gadwall. We also put up some trail cameras and set some stands for bow hunting….they have some monster bucks in the area! Looks like we are having duck for dinner! This deer wanted to take a selfie! "GreenMan" out of Minot, ND. Their music is in the traditional Celtic music of Ireland, Scotland, Wales and Brittany. That was something that she had never been to before! We also took an hour drive over towards Kief, ND to visit our friends Dan and Jeanie Sobieck (Chris' uncle). They own and operate Prairie Smoke Ranch, an upland bird and waterfowl hunting operation. We last saw them when we visited them last February in Dunnellon Florida where they have a great winter home. With waterfowl season in full swing they had a full camp with 9 dogs and hunters from across the country. Although the visit was way too short, it was great to see them. When the fun is done, there is work to do…. The great part about this work is that it is fun as well! There is plenty of field work to do. They raise of variety of crops on the farm; wheat, canola, pea, flax and barley to name a few. They had harvested pretty much everything before we arrived but there is still plenty of work to do in the fields. Barb and I spent hours in the tractor working the fields getting them ready for next year. I absolutely love being in the tractor! You see a variety of wildlife while in the field; deer, coyotes, fox, partridge, pheasants, grouse as well as hawks which see the tractors and an opportunity for an easy meal. The hawks have learned to hover right behind the tractor waiting for mice that are exposed after the field is worked over. They dive down and grab the live ones as they scatter or feast on the ones that were not quick enough to get out of the way of the equipment. It is amazing how they learned that the tractor is an opportunity for an easy meal. Not everyone appreciates the beauty of this landscape, some people just see fields and abandoned houses but there is beauty and wonder everywhere. You cannot help but look at the abandoned homesteads and wonder about the early settlers, what life must have been like and what it must have been like to live in such a raw environment. We are looking forward to our time here, spending time in the tractor, in the duck and deer blinds and visiting with our North Dakota friends........more to come! When we last left you we were “Feeling Minnesota” depressed and frustrated with ongoing issues with the emissions system on our 2013 GMC diesel dually. Our truck is in the shop for the 7th time in less than 2,500 miles and it seemed like the service dealers were throwing fixes at it to see if something would stick. Don’t get me wrong, they are all very nice and were working with GMC engineers directly to try and fix it. This round the truck had been in shop 5 days and we were anxious to hit the road. We were already 5 days late on our journey to North Dakota to help some good friends of ours with farm work along with some duck and deer hunting. Barb tenaciously called GMC Customer Service and worked with local dealer to find us a new truck if it came to that. We did not expect great or immediate results from GMC but we at least wanted to get ball rolling. On the up side this delay afforded us the time to see more of our family. We were going to miss seeing my sister Judy as she was out of town but she returned last weekend and we were able to watch the Vikings game with her on Sunday. Go Vikes, they won! Then on Tuesday we were able to get together with two more of my sisters Carol and Becky for lunch. So in some ways this delay was a blessing in disguise. Determined not to let this delay get us down Barb and I spent one afternoon doing some adventuring around the area. Taylor’s Falls is the home of Interstate Park, a beautiful park along the bluffs of the St. Croix River. The park boasts glacial pot holes. These potholes were formed as the glaciers receded and a truly magnificent wonders of nature with holes up to 60 feet deep. We also went to Dancing Dragonfly one of the local wineries with Bob and Greta for Greta's birthday! We had never been there before and we did a tasting of 5 of their wines. I tried several of the reds while Barb opted for the sweeter whites. We ended up buying two of the whites, one of which was a dessert wine that tastes like chocolate covered cherries. On Tuesday afternoon we received a call from the dealer saying that the truck was ready. This time they replaced the negative battery cable connected to the diesel exhaust fluid system. Who knew one even existed! With high hopes we hooked up at 5:00pm and drove 70 miles to the Cabela’s in Rogers Minnesota. We at least wanted to be on the outskirts of the Twin Cities and avoid the rush hour traffic the next morning. We made that 76 mile trip without warning lights coming on, further than we made it in our last couple attempts! The next morning we continued our journey to the Douglas ND area. Let me tell you, there is a lot of anxiety driving a truck that you have lost confidence in. Barb was tense and almost sick to her stomach as she drove the truck just waiting for the inevitable….the dreaded warning light. Mile after mile we drove northwest on I-94. 100 miles, 200 miles, 300 miles, we just might make it! We typically try to keep our travel days to 4-5 hours max but we just wanted to get there so we decided to drive the entire 8 hours if it would let us....400 miles, finally.... 506 miles!. Physically and emotionally exhausted we pulled into our friends farm about 5:00pm, we made it! No one was home when we got arrived, they were all at work or out in the fields. They slowly arrived throughout the evening, it was great seeing everyone again and we are looking forward to the next few weeks with them.......I don’t think we have ever been happier to arrive at a location!